Marc T. Woodard shares advice and tips for anyone interested in a fitness program to meet their unique needs and attain a healthier lifestyle in his guidebook of truths about fitness and health, “Ageless MirrorAthlete: Overweight and Unfit No More” (published by iUniverse). Readers can learn how to customize a fit, healthy-habits and active lifestyle program relevant to their fitness and health goals. “Ageless MirrorAthlete” discusses how big pharma, agriculture, fitness, health, diet and anti-aging industries harm consumers by selling over-processed foods, diet potions and pills, programs and services that offer half-truths and sometimes flat-out lies and increase health risk. Woodard reveals industry secrets — showing people how to safely, naturally and permanently lose the weight they want while getting fitter and feeling well without increasing health risk. 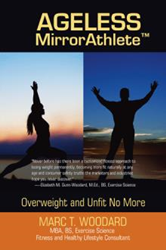 To purchase a copy and know more about the book, visit https://www.amazon.com/Ageless-MirrorAthlete-Overweight-Unfit-More/dp/1532053711. Marc T. Woodard has 40 years of experience as a fit, healthy lifestyle consultant and published co-author of "Working on Wellness, Fitness and Nutrition, Keys to Good Health" books for military service personnel. He owns MirrorAthlete, an online fitness secrets educational website and a former city councilor in his hometown of Tigard, Oregon. He retired from the Army after 20-plus years of service to his country. As a disabled vet, now dedicates his life by revealing fit healthy information through his writings. More information is available at: http://www.mirrorathlete.com .